An “I” course will start and finish with the Committee Boat stationed in the middle of the course. The number of legs will be posted. This course will always have an odd number of legs. If five or more legs are sailed, the start/finish line is not restricted — in other words, you may sail through it on a leg to the windward or leeward mark. The example at left shows an I-3 course. For a “W” course the start pin is also the leeward mark. This course can have either an odd or even numbers of legs. If an even number (e.g., W-2 or W-4) it will be a downwind finish and the committee boat will not move. If an odd number (e.g., W-3 or W-5) then the committee boat will move to the windward mark for an upwind finish. The example at left shows a W-3 course. 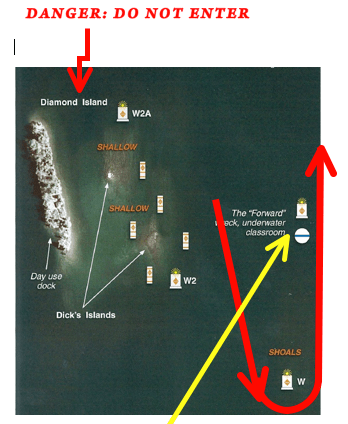 The “T” or Triangle course will start and finish with the Committee Boat stationed in the middle of the course. Legs 2 and 3 only are reaching legs, regardless of how many total legs are sailed; all subsequent legs are windward/leeward. The start/finish line is not restricted and may be crossed while racing. The examples above show a T-4 (upwind finish) and a T-5 (downwind finish). The “O” or Olympic course is another course with reaching legs, where the start pin is also the leeward mark. This course can have either an odd or even numbers of legs. Legs 2 and 3 only are reaching legs, regardless of how many total legs are sailed; all subsequent legs are windward/leeward. The start/finish line is not restricted and may be crossed while racing. If an even number (e.g., O-4 or O-6) it will be an upwind finish and the committee boat will move to the windward mark for the finish. If an odd number (e.g., O-5) then it will be a downwind finish and the committee boat will not move. The examples above show an O-5 (downwind finish) and an O-6 (upwind finish). Please note the following restrictions/requirements for the marks at Cotton Point, Canoe Islands and Diamond Island. When the southern Canoe Island mark is used as a mark of the course, note that both islands are also considered part of the mark and must be rounded to port as well. 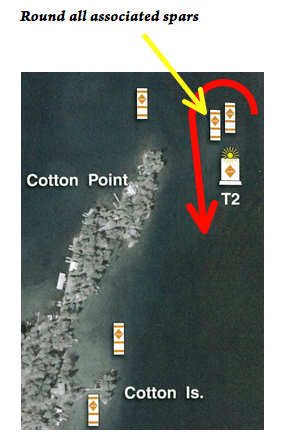 Be certain to round all pin buoys (spars) associated with the T2 mark at Cotton Point. Stay clear of the shallow area just east of the island marked by W2, W2A and associated pin buoys (spars). The dive buoy and mooring ball just north of mark W are not considered marks of the course.